The Maine Red Claws, presented by Quirk Chevrolet, today announced that four former Red Claws players have made NBA rosters to start the 2010-11 season. The NBA regular season tips off tonight as the Miami Heat visits the Red Claws parent club, the Boston Celtics, the Phoenix Suns visit the Portland Trail Blazers and the Houston Rockets visit the defending champion Los Angeles Lakers. Former Red Claws guard Maurice Ager, 26, will begin the season with the Minnesota Timberwolves. The 6-5, 202 lb. guard out of Michigan State averaged 15.6 points in 22 games with the Red Claws last season. Alexis Ajinca, 22, will suit up for the Dallas Mavericks. The 7-0, 220 lb. center returns to the NBA following an off-season trade from the Charlotte Bobcats. He averaged 14.6 points in 22 games with the Red Claws before being sidelined by a late season ankle injury. Bill Walker, 23, returns to the NY Knicks for his second season. In 27 games for the Knicks last season following a trade from Boston, the 6-6, 220 lb. guard averaged 11.9 points, 0.9 steals and 1.9 3-pointers in 27.4 minutes per game. He spent 9 games with the Red Claws last season, averaging 17.4 points. Lester Hudson, 26, enters his second season with the Washington Wizards following a 2009-10 trade from Boston. The 6-3, 190 lb. guard out of Tennessee-Martin spent 7 games with the Wizards last season and 8 with the Celtics, averaging 4.7 points per game. He averaged 14.6 points in 5 games with the Red Claws last season. 63 players with NBA Development League experience highlight 2010-11 NBA opening day rosters, equaling the previous high of 63 featured on 2009-10 NBA start-of-season rosters. Twenty-nine of 30 NBA teams feature at least one player with NBA D-League experience. 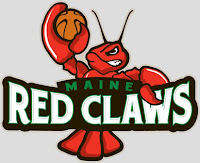 The Red Claws season will tip off on November 19 at home versus the Austin Toros. Tickets for the 2010-11 season are currently on sale and available at the Red Claws offices, located at 413 Congress Street (next to City Hall) in Portland, online at www.maineredclaws.com, and by phone at (207) 210-6655. The Red Claws will play 24 home games at the 3,045-seat Portland Expo Building, and individual game ticket prices will range from $5 for end zone seats to $30 for center court seats. Last season, the Red Claws became the only NBA Development League team to sell out its entire home schedule with 24 straight sellouts.